I know that I’m in the minority on this, but I actually liked “Terminator: Salvation”, and definitely prefer it over the very disappointing “Rise of the Machines”. It’s not great, let alone on par with Cameron’s first two entries in the series, which both were masterpieces, but it at least takes the franchise into a new direction, instead of offering the fourth variant of the same story (Terminator & Protector travel back in time to kill/save John Connor). Now, obviously, it’s not without its problems. One of which is that they seemingly couldn’t decide if this was supposed to be a reboot of the franchise, or rather a prequel to the future war-bits from T1 and T2. John Connor makes it clear that “this is not the future my mother warned me about” (even though that logic is insofar flawed as her knowledge of the future obviously would be very limited; something like Marcus could very well have existed in the original timeline too, but Kyle simply didn’t have time and/or feel the need to mention it.). It’s also obvious that “Salvation” follows “Rise of the Machines” and thus the timeline that was established there (meaning that Judgment Day happened in 2003, and not 1997). But now it’s only 2018, and Skynet already produces its first T-800s, which, in the original timeline, were a brandnew invention in 2029, shortly before Kyle Reese travelled back in time. So for whatever reason, and despite the fact that Judgment Day actually happened 6 years later, the sequence of events seems to have accelerated. Add to that the fact that Marcus is a new kind of Terminator that seems to be above Skynet’s abilities even in 2029, and it’s clear that John Connor’s statement that this is a new timeline is true. However, he still gets the same scars at the end that we could see on his face in the future war-scenes of “Terminator 2” (in the original timeline). Huh? So does this mean that “Salvation” will lead up to the same events after all? I dunno, I just found this very confusing, and would have preferred if they’d simply stayed with “this is a new timeline” instead of desperately trying to tie it into the events established in T1 and T2. Another big problem of the movie is that Skynet’s big evil scheme doesn’t make any sense. If it was all about killing Kyle Reese and John Connor, then why didn’t they programm Marcus to do exactly that as soon as he got the chance, instead of leading them to its headquarters? Also, the scene where Skynet reveals its big plan to Marcus felt right out of a James Bond-movie; it was extremely clichéd and forced, and – again – didn’t make any sense. Skynet had them, Marcus accomplished his mission. Why tell him the role that he played in the proceedings, and that he was just a pawn – other than for the sake of the viewers? Why restore and reactivate him at all, if he has served his purpose? It didn’t feel logical, but only sadistic – which didn’t really gel with the idea of an unemotional machine intelligence – and stupid, since this gave him the chance to actually save them. I also didn’t care for Star’s “spider-sense” concerning Terminators. There actually is an explanation for that in Alan Dean Foster’s novelization, but since it ends totally different from the movie, I don’t think that’s valid. As it stands, this idea of a little girl that has some kind of inner Terminator-detector – which never even remotely gets explained – felt weird to me. Also, the big harvester would have felt more at home in a “Transformers”- than a “Terminator”-movie, and the wormlike machines seemed to come straight out of “The Matrix”. The fact that so much of the movie takes place during the day also leads to a significant visual discontinuity compared to the future war-glimpses in the previous movies (which invariably took place at night). And the “Here, just take mine”-ending is rather far-fetched and asks quite a lot from the viewer in terms of his willing suspension of disbelief. Still, in my book, the good outweighs the bad. And even though I might lose a lot of geek-cred with this statement, I strongly feel that one of its greatest strength is McG’s direction, which to me seemed to be far more in line with James Cameron’s style than Jonathan Mostow’s “Terminator 3” was. He celebrates the action, and shoots it with a lot of flair and style. I especially loved the long shots without a (noticeable) cut (a proclivity of mine), like the helicopter-crash. That scene was in the best tradition of James Cameron, IMVHO, and a true eye-opener. I also quite liked Marcus as a character. He starts off from such an unsympathetic place (seriously, saying “So that’s what death tastes like” after kissing Dr. Serena, who’s dying of cancer, was incredibly cruel), but thanks to his “second life”, gets a chance to redeem himself – which he embraces. The whole movie, ultimately, is about exactly that: Second chances, redemption, and – hence the title – salvation, and Marcus is very much at the center of that. However, I also liked our glimpse of young Kyle Reese, and how he, over the course of the movie, started on his path to become the resistance fighter that later is going to travel back in time. John Connor plays a much smaller role than the marketing back then would have had you believe, but that never really was a problem for me, since I found Marcus and Kyle more than enough to hold my interest. Also, John very much is the impetus that drives the movie forward – even though he might get less screentime than some would have liked. I also really liked how the movie revealed that becoming the leader of the resistance wasn’t an easy task, since many saw some sort of false prophet in him. That was a new and interesting angle. As for the performances, I was and am especially taken by Sam Worthington’s turn as Marcus. While I wasn’t that smitten with his work in “Avatar”, which got released a couple of months later, I really liked his performance here, especially after he finds out what he is. For example, watch his face as he’s standing in front of the gate to Skynet’s headquarters. When they let him in, you can actually for a second see disappointment flicker through his eyes. I also really liked Anton Yelchin as a young Kyle Reese, since it was such an unlikely (and unusual) choice. I wasn’t quite as taken with Christian Bale, though, who – for whatever reason – seemed to work mostly on autopilot. Maybe that’s partly due to the problems on set – or maybe it’s the other way around, and those problems were symptomatic of his dislike for the project. Whatever the reason, he seemed a little bland here. I was also rather disappointed by the extremely little role that Kate played in the proceedings. Bryce Dallas Howard does her best, but they just didn’t give her much to do. Moon Bloodgood fares slightly better, but she’s no Linda Hamilton, and her character is no Sarah Connor. As for Helena Bonham Carter’s much discussed apperance at the end: For me, the reason why she would appear that way made sense. So while I understand anyone who could have done without that rather well-trodden portrayal of an artificial intelligence, it didn’t bug me. Danny Elfman’s score is ok. He creates a new theme, but Fiedel’s influence is still palpable, like, for example, in the instruments that he uses. Nevertheless, I would have wished for a more frequent use of Fiedel’s iconic theme, since there were a couple of scenes where I would have found it quite appropriate (one should also note that the so-called “Terminator drums” are not featured on the soundtrack CD – which could be because of legal reasons, or might be an indication that they were only added retroactively, after Elfman turned in his score). One of my favorite parts of the movie, though, is our glimpse into the prior stages of the future war, which would later lead into the scenes from it that we saw in the previous movies. I especially liked the older Terminators, like the T-600 with his rubber skin. Also, the animatronics and the effects were again absolutely flawless – with the digital makeup-effects on Marcus, the appearance of the Schwarzenegger-Terminator and the T-800-torso being particular standouts. Mostly, though, the strengths of the movie lie in individual, great scenes, like the helicopter-crash, the first confrontation of Marcus and John, the following hunt of Marcus, and especially most of the showdown in the Terminator factory (where my only complaint lies with the aforementioned Marcus/Skynet-scene). I was especially pleased by the appearance of the good old Schwarzenegger T-800, which when I saw the movie during my visit to the U.S., led to cheers and applause in the cinema. 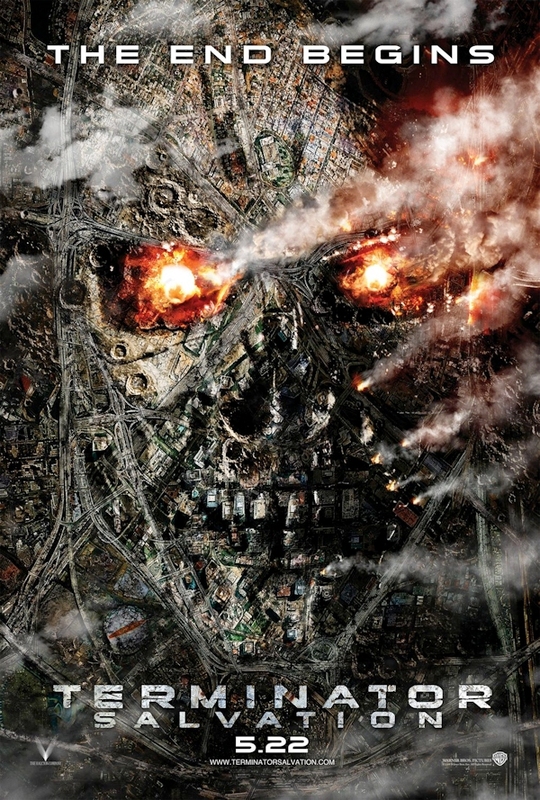 Overall, and despite its undeniable flaws, I found “Terminator: Salvation” to be much more entertaining and enjoyable than the irritating “Rise of the Machines”. This entry was posted in movie reviews, Movie-Flashback and tagged action, Anton Yelchin, Bryce Dallas Howard, Christian Bale, Danny Elfman, Helena Bonham Carter, McG, Moon Bloodgood, Sam Worthington, science fiction, Terminator, Terminator: Salvation. Bookmark the permalink.